What will happen if I eat 25 eggs daily ? 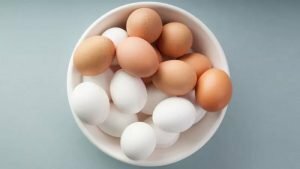 What will happen if I eat 24 eggs daily? One of my siblings used to do that, eat 12 for breakfast, 12 for lunch. They burned off the calories working. However, I have learned some things about eggs recently that lets me know that this would never be healthy. Eggs have sodium, and eating 3 eggs is probably enough sodium for your body for one day; any more than that is “overdosing” if it is eaten daily. The sodium will keep water inside your body, and this will make your blood volume greater, and thus increase your blood pressure. Eggs have a lot of protein, and I (at 63 kg) eat more than 3 daily, I am “overdosing” on protein. When protein is metabolized in the human body, it produces ammonia as a by-product. This is a dangerous neurotoxin that your body will get rid of as quickly as possible. If you eat 25 eggs daily, your body won’t be able to keep up. Ammonia will build up in your body—a condition known as hyperammonemia (you will have mental confusion, coma and eventually death if you aren’t cared for in a hospital in time and It is a dangerous condition that may lead to brain injury and death). So never try to eat that much protein!! Eggs also have vitamin A in them, which if you eat too much, accumulates in your body, which is not healthy. Sometimes people who eat too much vitamin A begin to have orange skin, while having too little vitamin A can cause blindness. So 1–3 eggs daily (or carrots for vitamin A) is much better than 24. Eggs are very good for you, just don’t eat 25 every day. MoveNfit is one of the largest online platform to hire a professional personal trainer at home, qualified in home fitness trainers and best health coaches online for men & women in the country. We offer a wide range of health and fitness services weight training, HIIT high intensity interval training, aerobic, yoga, one to one personal training and group training sessions in Karachi Pakistan. We also offer Skypercise (Fitness training via Skype video), Physio care, Physiotherapy services, and Personalized Diet Meal plan for weight loss. Copyright © 2017, MoveNFit, All rights reserved.